Heat oven to 425ºF. Place a 2-foot long piece of heavy duty aluminum foil on counter. Turn edges up about 2 inches on all sides. 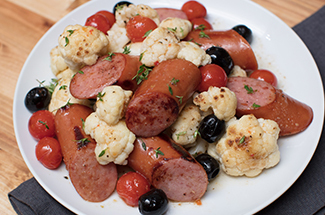 Place cauliflower in center of foil; arrange sausage around the cauliflower. Add olives, tomatoes and thyme sprigs. Drizzle with vinaigrette. 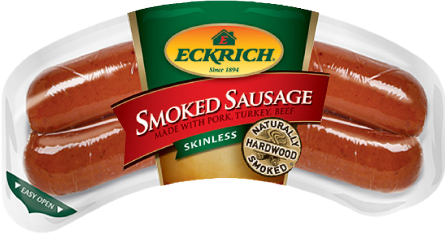 Fold edges of foil around sausage and vegetables forming a sealed pouch; place on baking sheet. Bake at 425ºF. for 35 minutes until cauliflower is tender. This is a perfect recipe for grilling. Heat gas or charcoal grill for indirect cooking at 500ºF. Grill Smoked Sausage with Cauliflower packet for about 25 minutes.